The first floor of the three-level building serves during an interim phase as showroom and sales office for the adjacent ‚IN-Beijing’ SOHO development which has been equally planned by RhineScheme. 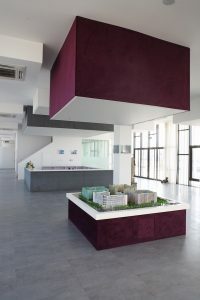 Later on it is intended to change the use to a club and property management office for the residents, with some hotel-like guest rooms on top where now five sample apartments are accommodated. 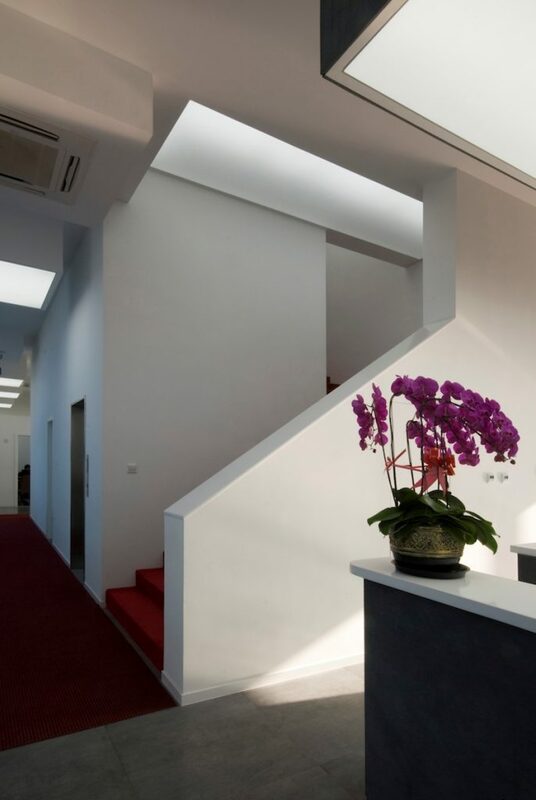 The architectural concept has divided the functions of reception & sales on one hand, sample apartments on the other hand in different levels. 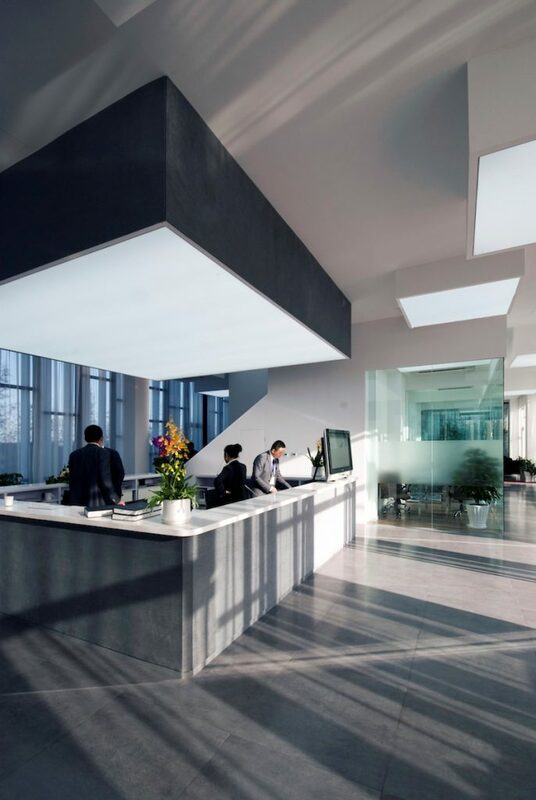 Continue reading "Majuqiao show & sales room interior"
In this way the ground floor could be kept slim in order to make full use of the daylight with its reflections and shadowgraphs created by the façade. 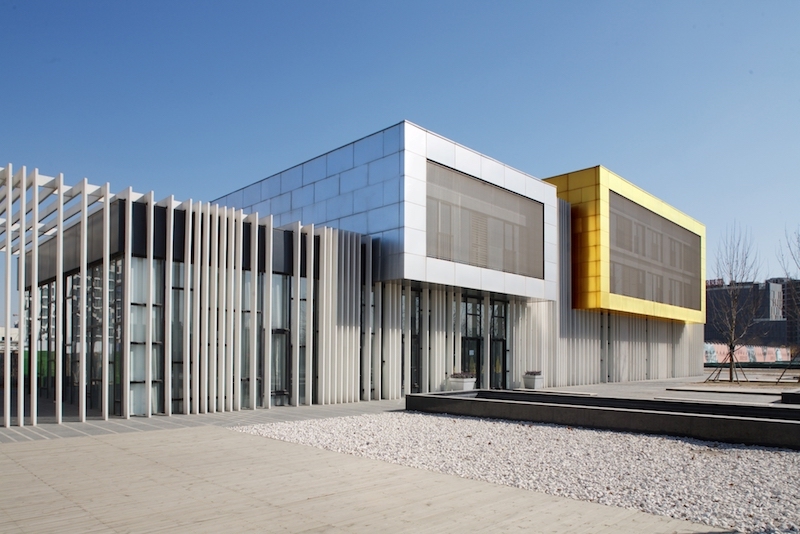 A bright and open space has been created, with fully glazed facades on all four sides. 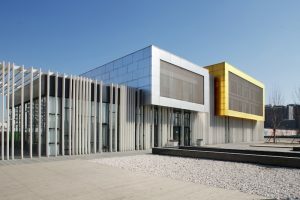 The space has been decorated and furnished in a decent and modern way, with reduced colours, shapes and built-in components, avoiding any exaggerated show-off effect. 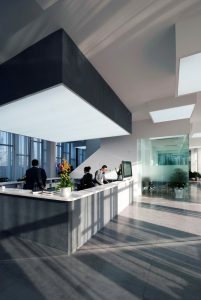 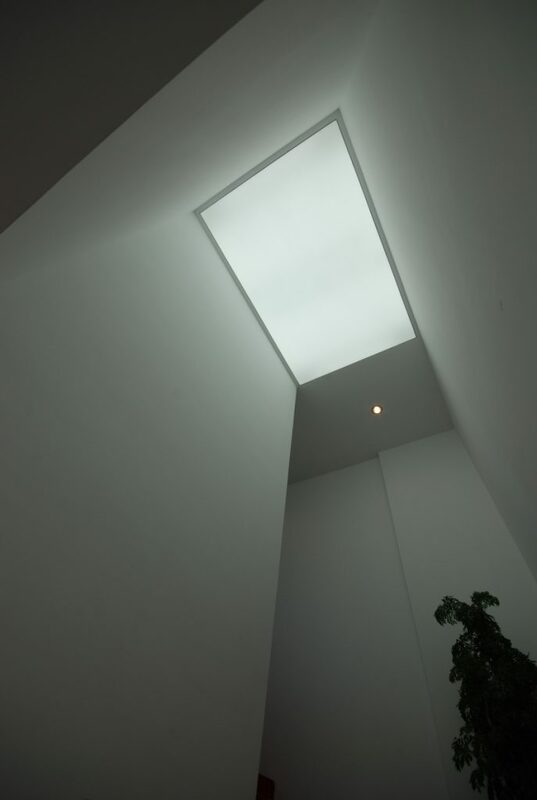 The artificial lighting is integrated in huge lighting boxes, cubes of different sizes and heights hanging from the ceiling, which thus become part of the space’s architecture. 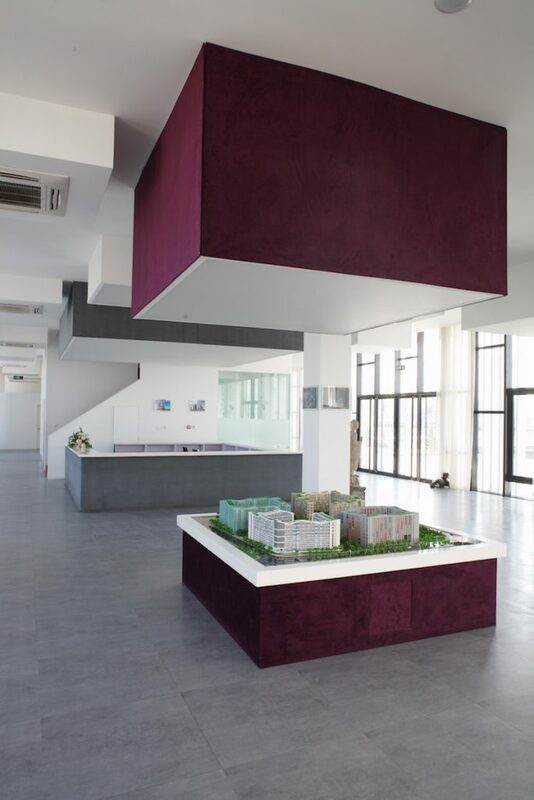 Only the illumination box highlighting the physical model of the SOHO project is set off in a dark purple colour; at the same time the box at the ceiling is mirrored in the shape of the model’s equally purple pedestal. 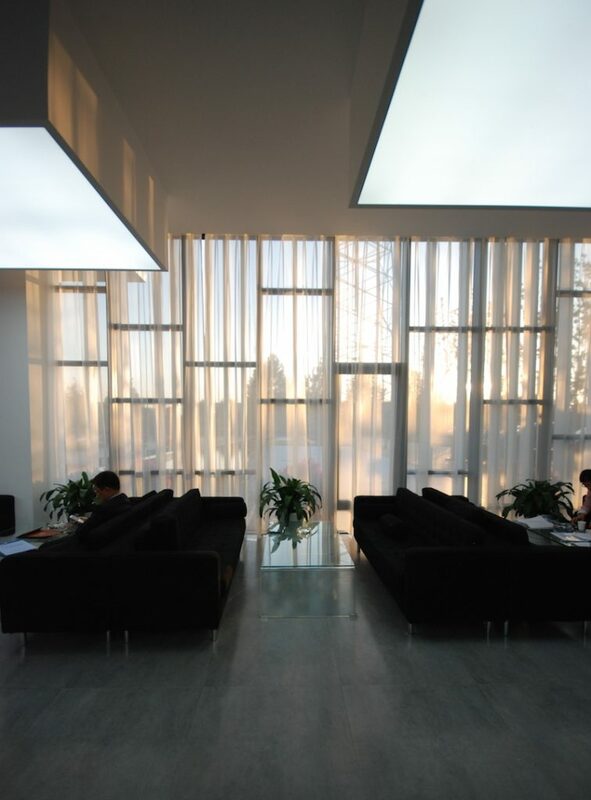 The few intimate negotiation and meeting rooms are separated by walls. 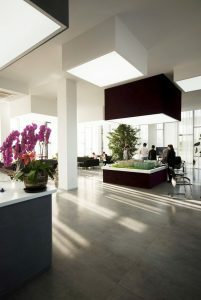 Other partitions are made of glass walls or glass boxes with integrated planting. Last not least the important staircase leading to the sample apartments in the second floor is emphasized and drawing attraction by a red carpet as the only strong colour in the whole ground floor.